Route of antibiotic administration for bacterial endophthalmitis? Endophthalmitis is inflammation (usually infectious) of the aqueous or vitreous humor that frequently leads to loss of vision. 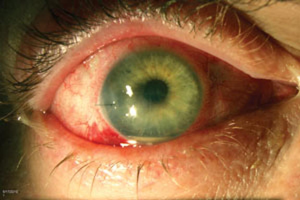 Endophthalmitis usually is caused by bacteria or fungi, or rarely by spirochetes. The most frequent cause is postsurgical, followed by penetrating ocular injuries and, rarely, hematogenous spread. History may include ocular surgery, hammering with steel, working with high-speed machinery such as grinders or weed whackers, or ocular trauma. Symptoms may include headache, eye pain, photophobia, vision loss, and ocular discharge. Physical examination may reveal erythema and swelling of the lids, conjunctival and scleral injection, chemosis, hypopyon, and evidence of uveitis. If suspected, immediate ophthalmologic consultation is required. Treatment may include aspiration of the vitreous or pars plana vitrectomy, and administration of intravitreal antibiotics and steroids, in addition to systemic antibiotics. Todays Facebook Winner is Priya Khawas Lamchhane, receiving a FREE Mock Test from GateToMedicine. You need to send us your email id to customercare@gatetomedicine.com. Congratulations!